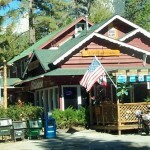 Tonight, three jazz music students will be “singing for their supper” at the Mile High Cafe in Idyllwild. They also get to order food from the menu that includes hamburgers and Korean BBQ. However, Walker, who arranged the gig, is quick to say that it’s not about the tips or the food, but the practice that’s important. Walker and his jazz mates, including Luc, a senior drummer, and Lucas, a freshman pianist, will play jazz, blues and free improvisation tonight. Drummer Luc plays with Walker twice a week anyway, because they belong to the same jazz ensemble at school. “This weekend is also parent’s weekend, and some people want to hear me play,” Luc added. 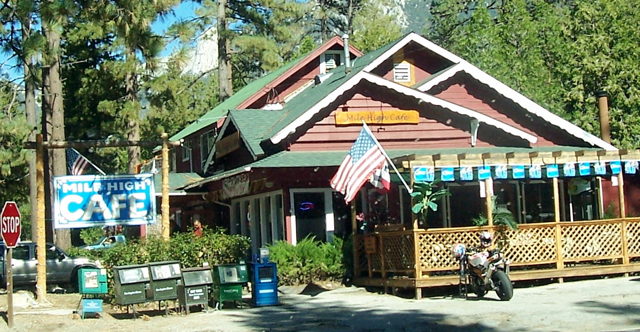 It’s not easy for Idyllwild Arts students to get music gigs in town. They can only play on weekends when classes are not in session, and must rely on the vans to transport their amplifier and instruments. 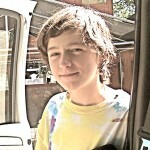 However, Walker, who comes from Vermont, is not shy about setting up music gigs. 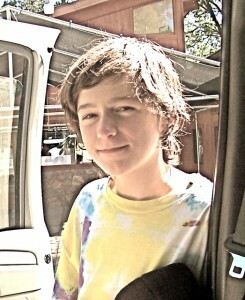 He’s played on the streets before with his dad in Provincetown, near Cape Cod. 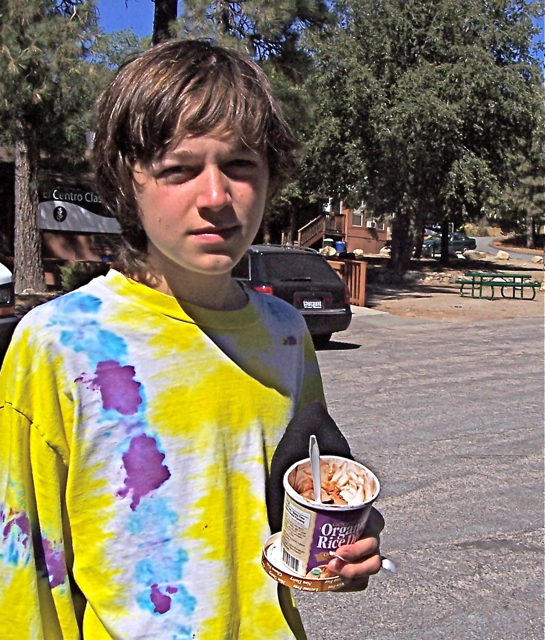 Walker said that he used the money to attend the Idyllwild Arts Academy this year. He also said that he learned firsthand about jazz students at Idyllwild Arts by reading this blog, Idyllwild Me. “I kind of wanted to know what it was like to be a student here before I applied,” Walker said. He had read an article about Jacob, a jazz sax player. 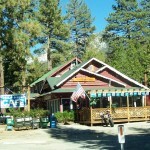 Walker added that he hopes to continue to play at the Mile High Cafe and other places around Idyllwild. Nam, the owner of Mile High Cafe, likes music and plays the piano herself. She used to run a piano school in Korea and had as many as 200 students. Sometimes, she plays the piano for her customers, but is generally busy making sushi and running the restaurant. Timmy, a classical pianist at Idyllwild Arts, who won the “Spotlight Award” in 2008, has also played at the Mile High Cafe. “He only played once this semester, but got busy applying for colleges,” Walker said. Walker’s jazz ensemble (comprised of guitar, piano and drums) will play tonight, Saturday, Oct. 16, from 6 p.m. to 8 p.m. at the Mile High Cafe, located at the corner of Hwy. 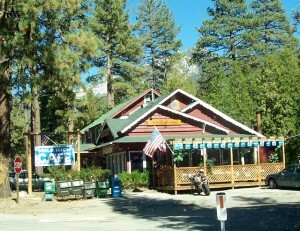 243 and Saunders Meadow Road in Idyllwild. 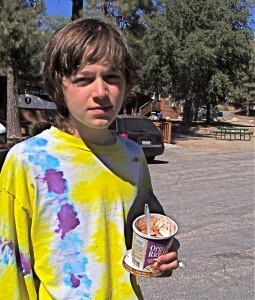 Copyright 2010 Idyllwild Me. All rights reserved. 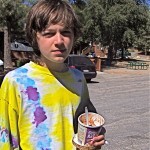 This entry was posted on Saturday, October 16th, 2010 at 10:18 am and is filed under Idyllwild Arts Academy, Music. You can follow any responses to this entry through the RSS 2.0 feed. Both comments and pings are currently closed.